Gum disease symptoms can be unreliable. 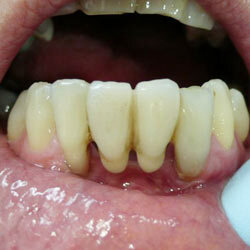 You can have pretty bad gum disease, and yet not notice anything wrong! BUT IF YOU DO NOTICE ANY SYMPTOMS, you should pay a visit to your dentist and arrange to see the hygienist also. What symptoms or signs might you notice? The first thing most people notice is your gums bleeding a little when you brush your teeth. Frequently patients tell me that they have brushed too hard because they saw some blood when they rinsed out. But bleeding on brushing is NOT caused by brushing too hard! (Unless you're using a wire brush!). Bleeding on brushing is caused by the gums being inflamed in the first place. That's the FIRST gum disease symptom. The inflammation is caused by bacteria collecting in a sticky film on the teeth. Your gums recognize the bacteria as being "foreign", and react. Like a splinter in your finger. You may also notice that your gums are a little puffy or swollen. Healthy gums should lie flat against the tooth. Your gums may appear red. Healthy gums should be pale pink. Other gum disease symptoms may include a bad taste in your mouth, or bad breath. As gum disease slowly progresses over the course of months and years, you will see your gums slowly receding, exposing the roots of your teeth. This recession cannot be reversed, except (in some cases) by extremely delicate gum surgery in the hands of a gum expert. Much better to prevent the problem in the first place! In the final stages of gum disease, your teeth will start to wobble, and become loose. You will notice that you cannot chew things properly, because your teeth will become tender to bite with. If you can put up with the discomfort, one or two teeth may even fall out themselves. At this late stage, there is NO TREATMENT available to help. Your teeth will either fall out themselves or become so painful that you will beg a dentist to pull them for you. And then your only options are plastic dentures, or costly implants and a bridge. It's important not to ignore any gum disease symptoms! As soon as you notice anything wrong, get yourself along to a dentist and hygienist, and ask the hygienist for her best advice. She will be used to people ignoring what she recommends, so it will be a nice change for her to have an interested patient! To read how to prevent these problems, take a look at How to cure gum disease. But to give you the most important point right here - you need to get the plaque off your teeth every day. One of the most efficient ways is by using a good toothbrush - I HIGHLY recommend the Cybersonic 3 Sonic toothbrush. Read MY review of this toothbrush HERE, and get your SPECIAL half price discount code! An extra cleaning method when you have gum disease is to use a HydroFloss oral irrigator with a capful of TheraBreath Perio Rinse added to the water in the water tank. If you use the fine "Pocket Pal" tips, you can clean effectively under the gum edges where the plaque can escape from toothbrushing. The Perio Rinse will release oxygen under the gum, killing the plaque bacteria. I recommend the Perio Therapy System Kit from TheraBreath, which comes with a gel for treating periodontal pockets. Remember, if you're looking for a new toothbrush, I STRONGLY recommend the Cybersonic 3 toothbrush. Read MY review of this brush HERE, and get your special DISCOUNT CODE for a half price deal direct with Amden!